How is Remodeling a Kitchen like Writing a Book? Then it came to me. 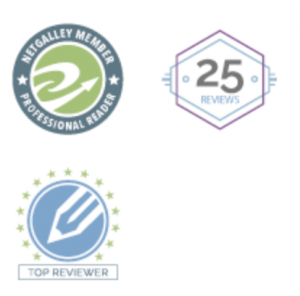 It’s like writing and editing a book! 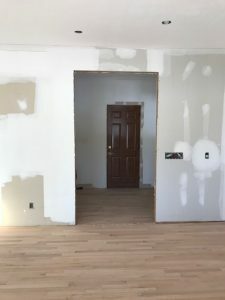 So, I decided when the kitchen was finished, which I know have to edit to say “further along”, I would a write post or two about my experience and compare it to the genesis of a book. Even now, as I sit to write, I’m not sure if I can manage to tie together the book and kitchen idea, but I’m going to try. I may have to stretch the simile a bit, but here goes. There are many stages in both creations. When you get to “The End” of your book, after spending months writing 80,000 words, your first feeling is elation. “I did it! 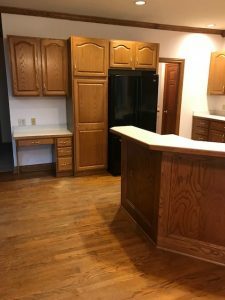 I wrote the bestseller that will change everyone’s life and make me rich!” Relating this to my kitchen, when we first moved in to our house years ago, I loved my kitchen. Lovely medium oak stained floor. A large peninsula! (you guessed it, our house was built in the 90’s.) New appliances. The snazziest kitchen ever. You’re going to have to edit and revise. So, you steel yourself and bravely begin the editing process. 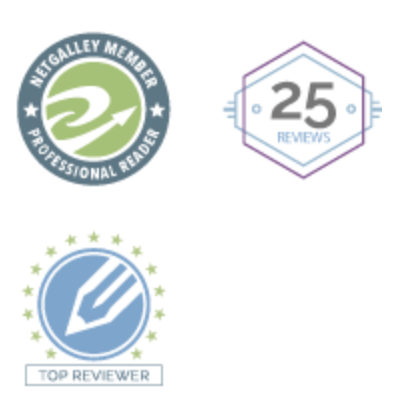 You read and review your manuscript and what do you find? Plot holes, the dreaded weak middle, boring dialogue, and even duller characters, who at times head hop. Sigh. 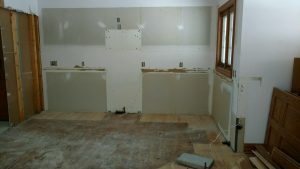 With the kitchen, I called my trusty remodeling guy and told him all of my kitchen woes. 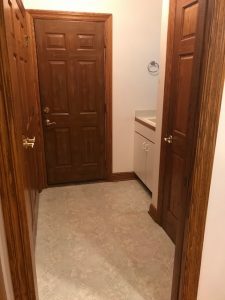 The entryway was too small, the kitchen work area was too cramped, the floor was a mess, the Formica was nasty. 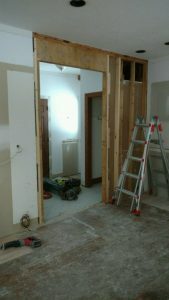 This is the narrow entry to to the kitchen. After coming through the narrow entry, you get trapped here. The peninsula, the wall of cabinets that blocks the way, the floor…no! 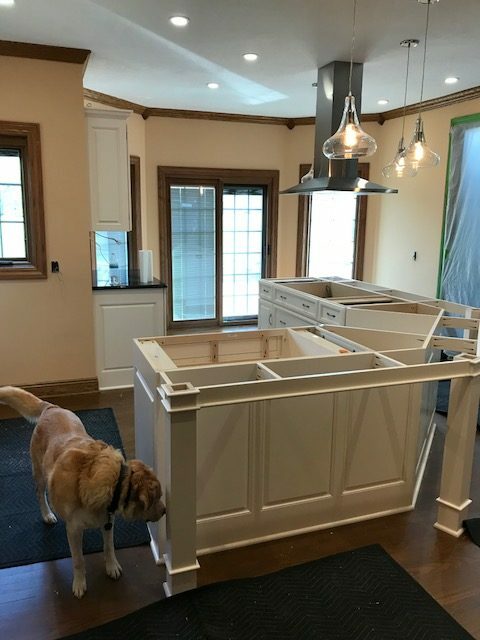 My remodeling guy, Chris, calmed me and we discussed what would improve the kitchen. He had some super ideas. Idea: increase width and height. 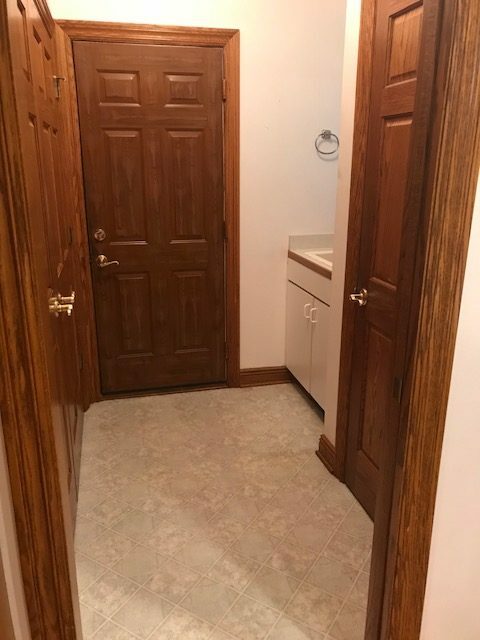 Extra points for load bearing wall! 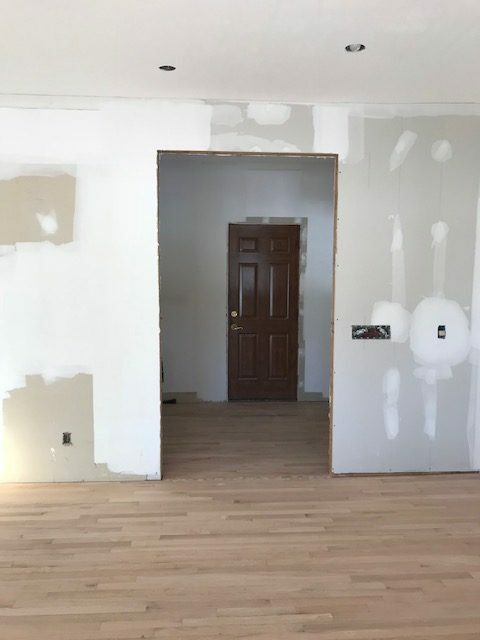 Stage 4 time to make the edits and rewrite and remodel. Your first thought when you chain yourself to your desk and begin to edit and rewrite is, “Oh, this won’t be so bad. I’ll brighten the dialogue, add a better secondary plot, get rid of the “ly” words, change the ending, easy-peasy”. Except when you start to pull out one thread or stitch, the whole story unravels and it turns into a major job. 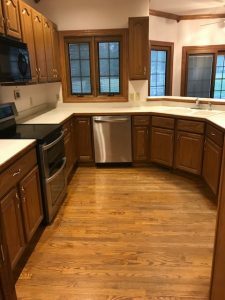 As you can imagine, or if you have lived through this process you already know, a kitchen remodel is a big deal. Everything is ripped out and then replaced. The ceiling, the gas,water, and power lines, new cabinets, new floor, new paint. Each step can be delayed. The cabinets weren’t ready, a few doors were damaged, the floor stain wasn’t exactly right. The fun part of editing and working on kitchens is the delightful “Aha!” moments. When you finally devise the perfect way to resolve that tricky part of the plot. (“Yes, no one noticed he was wearing scuba gear and a Hawaiian shirt!”) Or when you create a cabinet design that will allow you to store your Crockpot Trio, and hide the plug-in vacuum. 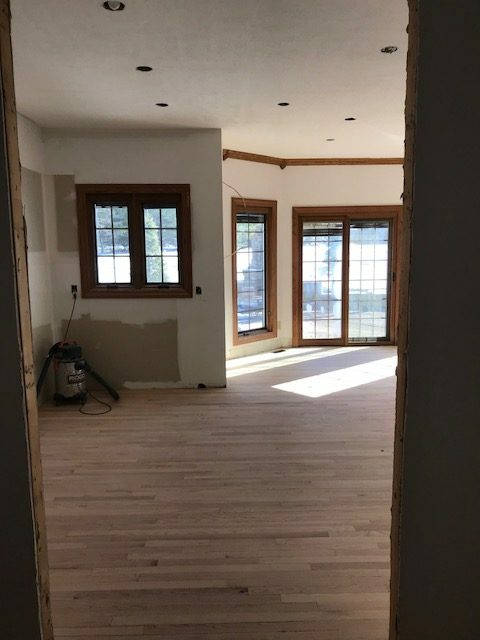 The floor has been sanded! Looking in from wider entry! We didn’t remodel the dog. New island! 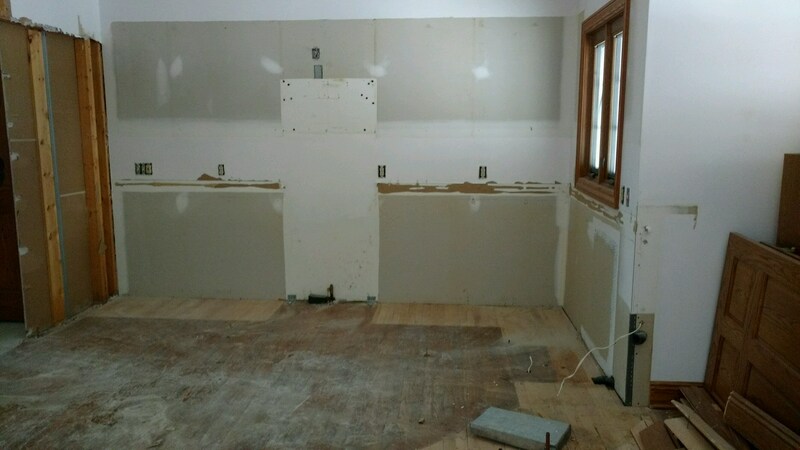 Wall of cabinets moved. Why the book is harder: I have to do my most of the writing and rewriting work myself. I didn’t have to do any of the heavy lifting for the kitchen. 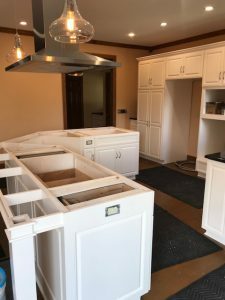 I did all the fun parts-choosing the colors, fixtures, granite. Why the kitchen is harder: This may seem obvious, but you don’t have a kitchen for the duration. We put the microwave and fridge in the dining room.For over three months. We mostly zapped Lean Cuisine type meals. Which was in a way beneficial because we are focusing on health so it kinda helped that we weren’t able to cook big meals. What both projects require: Inspiration, Creativity and Perseverance. 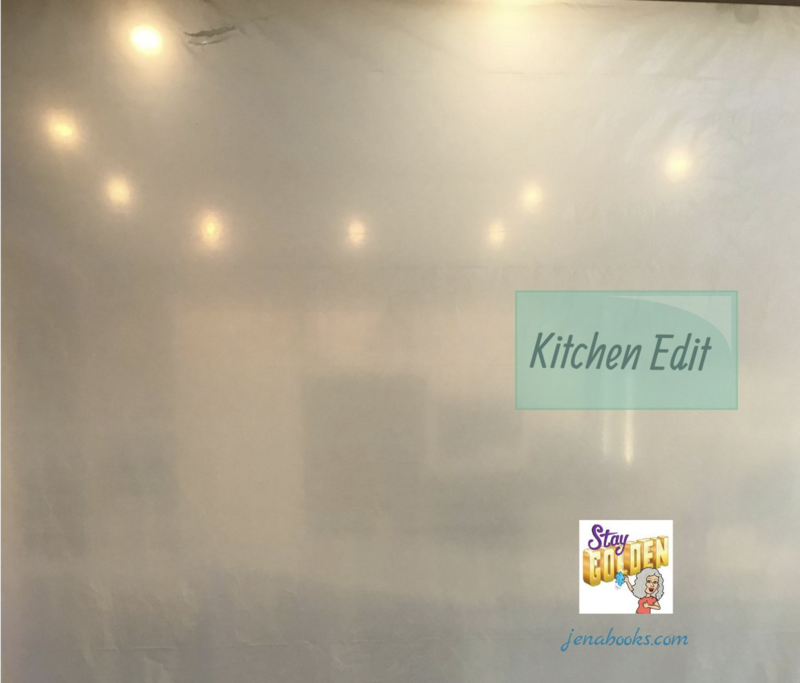 Coming soon…my Kitchen Reveal post! All finished and put back together! Please chime in! 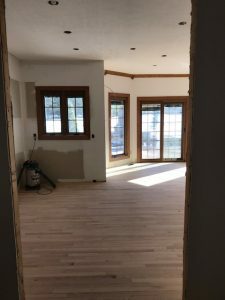 Tell me your remodeling stories and memories or your editing agonies. Stay Golden! This is brilliant and made me feel the pain and rewards of the process. It is reassuring to read this now – not sure I understand at the beginning of the journey. Thanks Jessie! Yes at the beginning of the edit or remodel, we feel so optimistic , don’t we? Then, the gremlins creep in…. Although I’ve never written a book or remodeled my outdated and horrible 1960s kitchen, I love this post. The comparisons fit. I cannot wait to see the reveal. I can’t either! We are so close…and yet so far! The emotions of going from idea to creation are the same! Thanks Audrey.and your kitchen is probably back in style!